Chicken fried steak is one of the world’s best comfort foods. It’s also one of the highest calorie and fat ways you can eat a piece of meat…pretty much, you know, ever. So it’s only a once or twice a year kind of thing. 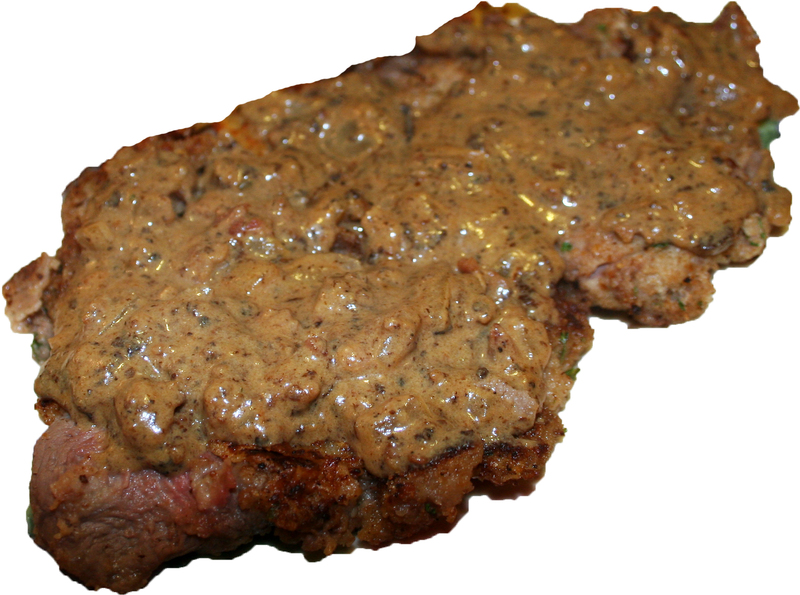 However, this version of the Cowboy steak is a slight variation on the old favorite. It’s got much of the same texture and, yes even the gravy, but it’s a fraction of the calories. Give this a try with my oven fries (this will be posted later on down the line). ***NOTE: If you purchase steak that isn’t thin-cut, place steak between 2 sheets of waxed paper and pound to 1/2-inch or less thickness. To get started with your cowboy steak, combine flour, 1/2 teaspoon of salt and 1/8 teaspoon of pepper on a plate. Combine 1/4 cup of milk and egg in a shallow bowl. Place bread crumbs on another plate. Coat a piece of steak on the flour plate; turn to lightly cover both sides. Next, dip steak in milk mixture, again coating both sides Lastly, dip steak in bread crumbs and coat both sides. Repeat with remaining pieces of steak; reserve 1 tablespoon of leftover flour. Spray a skillet with cooking spray, and heat to medium. Cook bacon; roughly five minutes. Remove from skillet and set aside. Off heat, coat the skillet again with cooking spray and add steaks; turn the heat to medium-high. Cook about 2minutes per side for medium, or longer to desired degree of doneness. Remove steaks and set aside. Off heat, coat skillet with cooking spray and set over medium heat. When hot, add onion; cook until tender, stirring occasionally, about 3 minutes. Add reserved tablespoon of flour; cook, stirring constantly, for 1 minute. Pour in remaining cup of milk, using a spoon to scrape up any browned bits from the bottom of the skillet. Reduce heat to medium-low; add remaining 1/4 teaspoon of salt and 1/8 teaspoon of pepper. Crumble bacon; stir into skillet. Increase heat to medium and cook until gravy is thickened, stirring constantly, about 1 to 3 minutes. Remember gravy will thicken slightly as it cools. Spoon gravy over the cowboy steaks and serve immediately.